On March 2017, the Australian Parliament voted to exclude online poker in the country, and the bill was passed in August 2017. However, this doesn’t mean you won’t be able to continue playing all your favourite online poker variants. Despite the departure of PartyPoker, PokerStars, and 888Poker, along with other leading online poker establishments, there are still several online poker sites willing to take a chance by providing poker games to online players in Australia. Most of them are honest, upstanding operators, but as we are sure you can imagine, there is still a handful that are less than reputable. 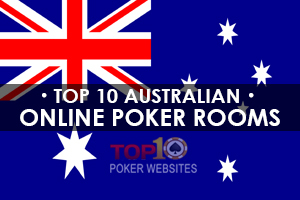 Therefore, we here at Top10pokerwebsites reviewed the existing online poker sites, still catering to Australians, to identify which of them provide the best online poker experience so that you don’t have to. 1. Are Australian Dollars Accepted at Online Poker Sites? 2. What is the Best Banking Option to use in Australia? 3. Can I Play in Another Currency than AUD? 4. What Poker Tournament Structures are offered? 5. Can I Set Up My Own Tournaments? 6. What Table Limits are in Place? 7. Can I Just Watch Poker Games? 8. Can I Play Anonymously? 9. Are High Table Limits on Offer? 10. Is it Just Poker Games I Can Play at Poker Sites? The Australian gambling laws are quite clear: There will be no penalties attached to online poker players engaging in online poker in Australia. The bill was passed solely for the online organisations that offer their poker products that will be subject to prosecution actions. This means, as an online poker player residing in Australia, that you can continue to participate in online poker without any fear or worry that you’ll be prosecuted. The Australian gambling law is very similar to U.S legislation when it comes to online poker, and no player has been convicted, prosecuted, or indicted while playing online poker as a citizen in the U.S. According to the popular stereotype, Asians love gambling. While this might be true to some extent, the citizens of China can’t hold a candle next to Australia when it comes to gambling. Australia has some of the biggest gamblers in the world with an estimated loss of $1,000 per adult, annually. Looking at things from an online perspective, the gambling scene is growing at an enormous 15% year-over-year. For several decades, the Australian laws regarding gambling have always been on the liberal side of the equation. A number of land-based casinos are spread across the country, with most of them offering electronic and table games alongside poker. Video poker machines and slots (known is Australia as ‘pokies’) are considered the most popular and is an extremely popular sight in clubs and pubs across the nation. For betting on sports, the Totalisator Agency Board allows both fixed-odds bets and tote wagers to be placed. There are more than 3,000 retail TAB outlets spread across Australia, and the locations range from isolated regions to rambling metropolitan areas. Bingo, or ‘housie’ as its locally called, is also available just about everywhere. Betting at online poker rooms, and online casinos were supposed to be eradicated thanks to the 2001 Interactive Gambling Act. However, penalties were imposed against gaming operators and not against the players. This allowed the citizens of Australia to continue playing with anyone that accepted their wagers and believe us; there were loads of offshore poker sites that were eager to flaunt the law. The Australian gambling regulation is achieved on two levels. The Central government ensures an active role in both amending or adding to relevant laws and the supervision of the gambling hobby. Regulation is also at the territorial and state level, with numerous regional authorities that carry out these functions. In 2001, the Australian Commonwealth Parliament passed the Interactive Gambling Act, and this legislation targeted online operators to protect the general public from harmful effects surrounding gambling. While Australian residents were still able to gain access to online casinos and poker sites without any fear of legal consequences, it turned out to be an offence for online operators to provide virtual gaming for real-money to anyone inside the Australian borders. It also banned advertisements relating to real-money online games across all platforms of media. These laws were applied to any interactive gambling services, regardless if they were situated in Australia or internationally. It’s worth mentioning that sports betting was not part of the restrictions, and Australian-based gambling operators weren’t allowed to provide their services to any overseas nation that was listed as ‘designated country’. In fact, online lotteries were also exempt, provided that the operator obtains the required license and wasn’t offering virtual scratch cards. The IGA was supposed to eliminate in-play sports betting, as it was considered to be one of the extreme temptations for gambling problems. However, it wasn’t truly effective, as several loopholes allowed operators that were licensed in Australia to continue to provide such wagers. Sports bettors may join a self-exclusion register online for a period of their own choosing (a period no less than three months). In 2016, The Interactive Gambling Bill was introduced and was successfully passed by the Senate of Australia in March 2017. The bill is expected to be approved in May during the next governmental session. Unless something unexpected occurs, it will become the new law of Australia a few weeks later. There’s nothing in the Australian law that makes it illegal for citizens of Australia to use or access online poker sites. Therefore, it’s legal for the residence of Australia to play poker online if they choose. There are several overseas online operators that gladly accept customers from Australia, so there’s a fantastic selection of online poker sites to choose from. There are also plenty of licensed sports betting websites available for Australians, too. Should you encounter any problems, you won’t be able to receive any assistance from your local authority. Therefore, you are basically on your own. Fortunately, this isn’t a major problem, as most online poker rooms and online casinos are licensed and regulated by other gambling jurisdictions. Keep in mind, however, that some of these jurisdictions are more specialised than others, so it’s always vitally important to do some homework before registering a new account at any online poker room and making a deposit. Another thing worth mentioning is that Australia, when it comes to gambling, has favourable taxation laws. The act of wagering (whether betting on the lottery, slots, sports, poker or anything else) will be considered a recreational activity, and any winnings won’t be subjected to taxation. This is one key area where the gambling laws in Australia are far more superior when compared to just about any other country in the world. In this final section of our in-depth and very informative guide to playing online poker from anywhere in Australia we are going to be answering lots of questions that new players from Australia will have. With that in mind below you will find the top 10 most asked questions Australia based online poker players are seeking the answers to and underneath each of them you will of course find the answers to those questions. You will certainly not want to be forced to play in any alien currency that is not Australian Dollars when playing real money poker games online or when you are taking part in any online poker tournaments. As such we are happy to let you know that you will be able to set your online poker site account to use AUD at any of our featured online poker sites. That does of course mean your deposits and also any withdrawals you make of any winnings will never see you having to lose a percentage of those deposits or withdrawals for Forex related fees and charges. It will be dependent on just how quickly you will want to get paid your winnings form any Australian online poker site in regards to which will be the very best banking option you should select. For when you use credit or debit cards or select a bank wire or bank transfer as your preferred banking option there can be a few days delay in your withdrawals reaching your account when you have requested a winning payout. We would strongly suggest that you consider using a web wallet to keep all of our online poker playing bankroll in, for when you make a deposit or a withdrawal using a web or an e-wallet you will find your deposits are instant and your withdrawals reach your chosen web or e-wallet much quicker. However you are free to pick and choose just which banking option suites you best so do take a look around at our banking section of this website for a round up of the available ones. Whilst some poker sites only have one single currency offered to their players many poker sites will be multi-currency poker sites, so when playing at the former you will be forced to have to play in the poker sites preferred currency. All Australia based online and mobile poker players do have a huge range of different poker tournaments that they can take part in and enter, both mobile and online Australian player friendly poker sites have plenty of tournaments up and running throughout the day and night. If you are living in Australia and want to find out just when any poker sites poker tournaments are up and running then visit the poker sites websites and take a good look through the poker tournament schedule as that will enlighten you on how every poker tournament has been structured and designed and when it will be going live too. There is also going to be very unique features that will be available to you at some online and even mobile poker sites and that feature ill allow you to set up your own private poker games and private poker tournaments too. So if you do want to play poker games or set up poker tournaments that only your friend or family members will be able to enter then make sure you checkout those poker sites offering this feature of which we have several listed throughout our website! You will find pot limit games and no limit poker game variants on offer at all of our featured poker sites and as such it doesn’t really matter whether you are a high stake play or a low rolling poker players there will always be more than enough poker games available to you. In fact, the cost of entering some of the many different poker tournaments are suite varied ranging from free to enter freeroll tournaments to tournaments that have some mega sized entry fees, so there will be plenty of them that suit your bankroll and your playing style too! One of the many advantage of playing poker online is that you are going to be able to play for free and access a range of free play poker tables and poker tournaments, which you cannot just sit there are watch a poker game or poker tournament in full flow. Unless you are actively playing in those games or tournaments by playing or fee you will of course be able to experience firsthand how the games play and pay, so make sure you at the very least sign up and play for free at our fat rued Australia player friendly online poker sites! You will also find that some poker sites will generate and issue you with a random username when you sign into your poker site account and that will ensure you can flit and move around he poker tables and play in different poker tournaments without other players being able to identify you. So if you want to have the peace of mind in knowing your poker game play will not be tracked and you will not be identifiable by other players opt to play at any online poker site available to Australian poker player than use anonymous usernames and tables! As you are going to find plenty of no limit poker games on offer to you then if you are something of a high stake poker player you will always find enough high limit, well in fact no limit poker games on offer. Just make sure before you do play for very high stake levels you know how to play the poker game variant you have chosen optimally and with the best strategy in place! Australia based players who sign up to any of our top rated poker sites are going to discover that they are not only going to be able to play poker game variants and also enter online and mobile poker tournaments at those sites for all of them also have available a range of different poker side games too. If you ever fancy playing pokie games or roulette games for example alongside your chosen poker games or poker tournaments or any other type of casino based games those games will also be available, so you can have plenty of additional gambling opportunities at each of our selected Australian player friend online and mobile poker sets too!